Vyasa-puja is an annual celebration by devotees of Lord Krishna to offer homage to their guru, or spiritual teacher. Krishna Himself says that what He likes most is when someone likes His devotee. Each year, the Bhaktivedanta Book Trust publishes a limited number of copies of a Vyasa-puja book—a collection of homages to Srila Prabhupada from disciples and temples all over the world. We would like to invite you to submit your Vyasa-puja offering right here, to be published on Krishna.com. 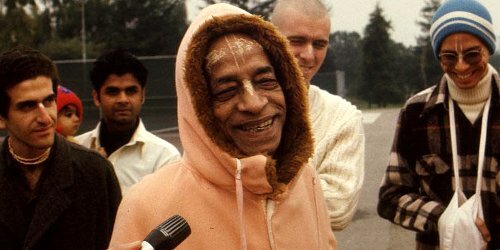 What have you learned from Srila Prabhupada? How has he affected your life? (If you met Srila Prabhupada) do you have personal memories of His Divine Grace that stand out in your mind? What instructions did you receive from him? What victories or successes have you enjoyed as a result of following his instructions or teachings? This opportunity is open to anyone who would like to thank Srila Prabhupada for spreading Krishna consciousness, and is not limited to homages in writing. Join the celebration by sharing your thoughts, respects, realizations, and homage. “Homage” means “public appreciation.” Simply email us to share your appreciation and praise for Srila Prabhupada with the world. A selection of previous year's Vyasa-puja books are available for download from our Homages to Srila Prabhupada page.